"If writing history tell it as it is.. why omit facts, unless you want a pat on the head from those who would like to conceal it, brush it under the carpet and pretend it didn't happen like so many grant aided and funded parrots are presently doing., Peadar Kearney , the man who wrote the Irish National Anthem also wrote another song and a line in it goes, "Oh, we want to be English when we die, ".. and I don't think he had ever been to the Falls Road. Arthur Chichester they actually have streets named after this mass murdering bigoted scoundrel in Belfast. It was about 1950, we had just moved into the then new Ballymurphy housing estate, right at the foot of the Black Mountain, Newbarnsley, Moyard, Dermott Hill, Turf Lodge and Springhill were yet to be built, we had virtually moved into the countryside, I was six years old. It was springtime as I and my father rode on bikes up what is now called the Upper Springfield Road, a narrow hedged road that started at the corner of the Whiterock Rock and ran up through the village of Hannahstown. As we rounded a right hand corner my father, pointing at the lower slopes of the hills, said , “Joe, there is a sight you will remember the rest of your life.” The field was covered in a huge carpet of Blue Bells.. this wonderment was my first sight of Hannahstown. I have often thought of what my father said, and he was right, but as I grew older and my interest in history developed I learned Hannahstown had many more wonderments, mysteries, stories of atrocities, heroism and a centuries old struggle of a mountain people to retain their faith and Irish national identity. To tell the story of Hannahstown one must take in the history of the Divis Mountain Range, and Belfast to a lesser degree for Hannahstown came into being when wealthy Catholic landowner and cattle grazer, John Hamill gave an acre of land consecrated by Fr. Hugh O’Donnell, for a cemetery, his wife Hannah took much to do with the church’s efforts in the area and ironically their baby daughter Hannah, named after her mother, was one of the earliest interred in the cemetery at a little spot which they had consecrated by Fr. Hugh O’Donnell and which soon after became the burial place for local people, which soon was joined by a small Above; The Hamill Crypt building paid for by Hannah Hamill to be used as a school, which in turn acted as a Catholic Chapel for a period and so became a village in its own right. In old documents I have the area is described as “Hannah’s Town” as does Benn’s “Belfast” Pub;1823, which gives credence that it derived from a Hamill link. John and his wife Hannah, had nine children, Hannah Maria who died very young, Michael Thomas, who died in New Orleans in 1857, Arthur Hamill, JP. DL, who died 10th May 1903, Daughter Margaret, died January, 1904, Daughter , Kate Davis, Daughter Jane , Daughter Maria , Daughter Hannah, (This Hannah and Marie are named after the little sister Hannah Marie who died) Then daughter Teresa, who out lived the whole family. Few, who would know their history, would deny that Hannahstown was the backbone of Irish Catholicism in the area in which now lies Belfast City. Without the brave determination of the ancient Irish community and particularly the Hamill and McQuillan families, who hung tight to the Parish of Derriaghy, Hannahstown, there would be no local area that one could point to and say, there lies a piece of ancient Ireland. Here there are traces and records of Irish traditions, folklore, and culture when Belfast was but a bog. A bog whereon the English planters under the Pirate Arthur Chichester could establish a foothold for the English Protestantism of Elizabeth 1st. Chichester a Pirate once with a price on his head by England was enlisted to reek murder and mayhem in Ireland after the killing of his brother John at Ballycarry, plus the humiliating defeat of Essex at the battle of the Yellow Ford by Irish Forces, sending him home with his tail between his legs only to be hanged by his lover Elizabeth 1st in her embarrassment at his defeat. In this in would appear Mountjoy’s Secretary seen things differently for he wrote, “ It seems incredible that by so barbarous inhabitants the ground be so manured, the fields so orderly fenced, the towns so frequently inhabited and the byways and paths so well beaten, as the Lord Deputy found them. The reason thereof was the Queen’s forces during these wars never till then came among them”... this was the uncivilised people Chichester spoke off ? .be so ashamed of Chichester’s tyranny and bigotry that they would change the names of anything that was created to ‘honour’ this ogre He obviously had a lot in common with Mountjoy who promised the dying Elizabeth that he would hand her over Ireland, which had been described as having nothing but “carcasses and ashes” . This is just one brutal aspect, with out touching on the organised destruction of their religion, their churches the people around the Divis range to Lough Neagh shore suffered and survived when, as I said, Belfast was but a muddy track by the Lagan. Hannahstown is a hallowed and sacred spot, here lies a living museum that witnessed the extremities of every era of Irish history, going back centuries. Today some ignore or perhaps are unaware of the historic continuity of the old area, not that it is a little known secret , read now what Historian Cathal Bradley had to say about Hannahstown many years ago, "For the retention and restoring of the Faith in this City no place contributed so much as the Blessed District of Hannahstown. To its hills in times of persecution our people rushed for safety. Its secluded spots supplied their places of worship and its homes and caves gave protection to the Priests who braved all dangers through the years to visit the Catholics of the growing town. Honoured with a proud and distinguished history, it is perhaps our most interesting parish." Cathal Bradley was a historian very much of the breed of Francis Joseph Biggar and Cathal O'Bryne, they wrote and recalled history as it was, they didn't attempt to re-write it, nor did they wish to be seen as 'moderates' who write through grey, very grey tinted spectacles, nor will I, for that would dishonour the noble struggle of past generations of Rock, Derriaghy, Tullyrusk, Hannahstown people who left us such a rich local seat of proud history, culture and Irish Heritage, disproving the adage that history belongs to the victor, and its slavish scribes seeking place and patronage.! Templepatrick, “The Stone Chapel Of Patrick” is also a most sacred Irish spot for it was there in in the 5th Century St. Patrick himself over 1500 years ago set up a Chapel baptising locals at the local Holy Well. The Chapel would have been roughly where the Mausoleum is in the centre of the cemetery inside the grounds of the now Castle Upton, An interesting wee story is that when the strangers began blasting for a quarry some 100 years ago it caused the Holy Well to dry up, but mysteriously the whole quarry was suddenly flooded, and the machinery lost,.. folklore say the wee folk were angry at these strangers for desecrating the Chapel of St. Patrick the Irish Apostle, indeed it has been said that the Upton’s and the original builder and inhabitant of the castle, Sir Humphrey Norton, were cursed. It was Arthur Chichester, murderer and Pirate who ‘gave’ , the land to Norton, like as if it was his to give anyone, and by 1611, Norton Build Norton Castle. But when his only child, a daughter, ran off with a dragoon sergeant he disinherited her and sold the Castle to Upton who renamed it “Upton Castle”. Upton had been living previously at “Upton Fort”, behind “The Bohill” a Hannahstown Hill, it must have been then that one of the Upton females married Dunn, a Catholic Warrior who lived near the old Amphitheatre atop The Bohill, a spot where Chieftains were elected and vital matters were discussed by the Irish Chieftains for centuries. However the fact that the Upton woman and Dunn had three children who obviously were being reared Catholic was greatly resented by the invader element and so they attacked Dunn’s Fort and burned it to the ground with the family , Dunn, his wife and three children in it. It was here that the English ’historian’ steps in, he attempts to explain the atrocity away with a story that it was Dunn who burned the house with his wife and children in it because his wife would not turn Catholic, he admits Dunn was never heard of again but says that “Dunn was heard to shout and scream in delight as he watched his family burn in his property on the Bohill Hill which he said is now known as ‘The the hill of pleasure ’, needless to say nowhere can it be found that anyone but that apologist ’historian ’ referred to it by that name, Dunn disappeared alright he died in that fire, murdered with his family. Meanwhile, in 1579, Sir Humphrey Norton had got procession of Castle Robin a former ancient castle of the O’Neill’s, he spent a fortune on it only to die without issue and the Castle lies in ruins today, the moral of this story is ‘never mess with the little people ’. 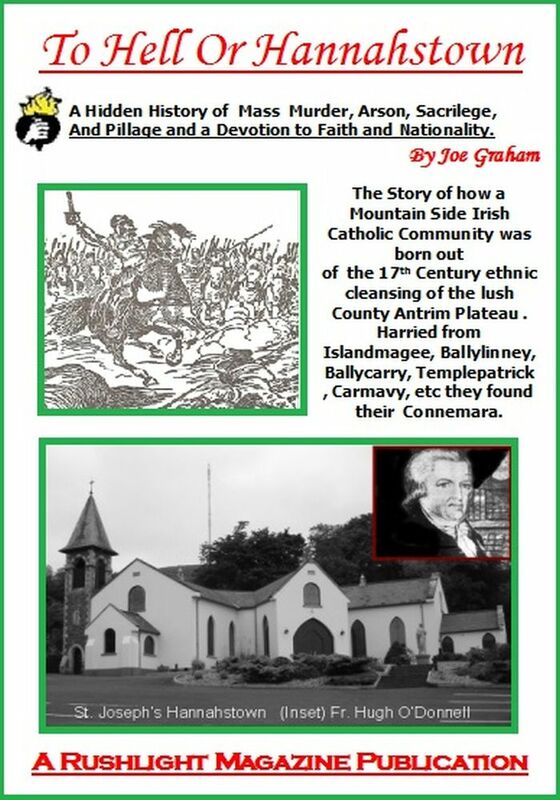 By the Mid 1600’s every Catholic man, woman and child in the Templepatrick area had either been murdered or sent fleeing to the mountains looking for shelter, those who fled to the ancient Chapel in the town land of Carmavy locked themselves in only to be bombarded with cannon balls , the building burned and the walls were tumbled in on them. For years the area was known as “The Place Of The Slaughter” Some years later the planters began using the chapel grounds as a cemetery and when gathering the stones of the ruined church to make their huge crypts(left) they found cannon balls and human remains under them, that English historian again explained them away with.. “The Irish Rebels retreated to the Chapel to make a stand and so perished ..”, The appalling and shameful truth is that since before the invasion of Henry II down to our own day the English have written the history of Ireland for the rest of the world, and it is only what England wanted them to know of us that the people of other countries learned about us and our struggle against the invader, sadly our tame home spun ‘historians’ of today are doing no better. There is much evidence of Chapels and Monasteries, around what is now known as Belfast some well known others not so, at Stranmillis there was the ancient Chapel, Capella De Kilpatrick, and also Capella de Crookmuck, at Malone, (Plain Of the Lambs).On old Maps the Glen Road (left), is to seen named as Hannaghstown Road (note the Spelling) and it was here between that road and the Falls Road was nestled Callender’s Fort, and close by was an ancient church complete with graveyard and ancient Round Tower. Lambeg is also a sacred spot for here an Ancient Franciscan Friars Monastery was sited. And we of course know at one time there was an ancient Chapel at Kilwee, where many religious objects were unearthed. It is with all this in mind that I am attempting here to point out just how neglected our sacred spots are, how we are robbing ourselves of an ancient identity and sense of belonging, yes indeed, we don‘t even attempt to correct that false history that now passes as a matter of fact now. I have mentioned how some streets and place names are named after all sorts of scoundrels. Can any one see any streets or roads named after Fr. O’Hamill, Fr. Magee, Fr.O’Mullan, Fr. O’Donnell, four priests who served in the area in most adverse times saving the faith from extinction, and particularly Fr. Phelomy O’Hamill who perished in a cold Belfast prison cell, martyred as sure as was St Oliver Plunkett for his faith. No statue marks the hallowed spot where the Champion Cleric Fr. Hugh O’Donnell died in his sister’s home at Springbank, Hannastown. To give an extend of the tremendous wealth of the Hamill family, a few statistics may be of help, ..
John Hamill, Ballycollin, 40 acres of Land, from the Marquis Of Hertford. John rented two houses on the land to Thomas McCrory and John Desmond. John also leased 42 Acres from The Marquis of Hertford at Derriaghy. John also leased from the Marquis of Hertford 116 acres of land and a small house which he rented out at Slievenagravery . Robert Hamill leased from the Marquis Of Hertford, 10 Acres and a House in Aghalislone. Robert Hanna , rented a small house and garden at Derriaghy. Michael and his wife Jane had three sons, Thomas, George and Arthur. James Hamill rented a house and Garden from Henry Thompson at Kilmakee..
James Hamill also leased from the Marquis Of Hertford, 6 Acres of land at Ballycollin, James Hamill married Anne McQuillan at Hannahstown Chapel 7th February 1852, so obviously this was their first home together. Thomas Hamil leased a house and small garden from William Girdwood. Bernard Hamill leased a house and 23 Acres of land from Rev. William Crawford. ’s later. John Hamill demolished his old property in the first decade of the 1900’s and replaced them with the Hamill Street and John Street we know today. John Street was built roughly on an old Street formerly known as Lettuce Hill. The Hamill’s also owned about 1000 acres of land on the North side of Belfast, so you can see they were extraordinarily wealthy people, let alone Catholics in that era of history. Some of the names above were not directly from the John and Hannah union , but could be traced to Arthur Hamill, butcher, (1807 Belfast Street Directory)1 Hercules Street, friend of Fr. Hugh O’Donnell, and neighbour, at that time Fr. O’Donnell by now P.P of the new St. Mary’s was living in Hercules Street. Arthur we know had two sons, at least, Michael and John, as I said earlier , This John and wife Hannah, had nine children, Hannah Maria who died very young, Michael Thomas, who died in New Orleans un 1857, Arthur Hamill, JP. DL, who died 10th May 1903, Daughter Margaret, died January, 1904, Daughter , Kate Davis, Daughter Jane , Daughter Maria , Daughter Hannah, Daughter Teresa. This, the wealthy branch of the Hamill’s have died off although distant relatives of them can still be found around the general area. Old Arthur started the family wealth with his butchers/provision shop and later the family had four shops in Belfast, each one ran by a Member of the family. His son brought it all a few steps higher up the social ladder when amazingly, being a devout Catholic, he joined the Conservative Party, and was elected to Belfast Council. The conservatives, being of course from Planter stock were in control and ‘ownership’ of Irish land so John was moving in circles whom most Irish Catholics seen as alien, indeed some even seen as ‘the enemy’. Hamill, John, provision merchant, 36 Waring Street. BELFAST CATHOLIC INSTITUTE ASSOCIATION(Limited) Registered according to the Act 19 and 20 Vic., cap. 47. Capital £6,000, in 6,000 shares of £1 each. Offices, 2 Hercules Place, Belfast He also contributed toward the building of St Peters Chapel. And later his son Arthur became a member of the Conservative Party and a member of numerous committee’s in Belfast. ELECTED GUARDIANS Poor Laws Union .St. George's Ward - John Hamill & David Taylor (Vice-Chairman) Ballymurphy - Arthur Hamill. Committee on Police Affairs - David Taylor, chairman; James Carlisle, John Hamill, Theobald Bushell, Robert Atkinson, James Cochrane, Robert T. McGeagh, Robert Boag, William Bell, William Bottomley, David Taylor, William John Johnston, Samuel Black, William C. Heron. Town Improvement Committee - William Mullan, chairman; Wm. Dunville, James Carlisle, John Preston, William Mullan, Robt. Patterson, Alexander Mclaine, William Ewart, jun., Robert Lindsay, William Bell, Charles Lanyon, John Hamill, William Bottomley, Robert Boag, John Lytle, Victor Coates - This Committee meets only when specially summoned. Through the above lists one can see the Hamill’s were moving in circles which included the wealthiest and most affluent citizens of Belfast but still, throughout the late 1800’s the family were greatly identified with the growing parish of Hannahstown, which had moved along way from the little Chapel of Derriaghy (left) which had been repeatedly attacked through the years, including by yeomen in 1798 and in the recent conflict. Hannahstown by now housed a beautiful Chapel and priests residence and more importantly for the Hamill family the name for the area, Hannahstown had become well established. St Joseph’s, left, was flourishing. John and his wife’s dream of perpetuating the memory of their little daughter, Hannah Marie had become a reality. Things had moved greatly since that first little school (Left,) in the area a fully fledged community and local identity had taken place and of course it was with the help of other great local families like the McQuillan’s, Close, and perhaps here some records of marriages etc, in the area will help to identify those other families with long links to Hannahstown area. My grand daughter Deborah at the Fairy tree, Divis Road, close to the Magnetic Hill, and in the back groud lie the Giants Grave. In the background can be see the old RUC Firing Range. The Old Hannahstown Hotel Now long gone. Copyright © 2007 Joe Graham, Rushlight Magazine, All Rights Reserved.